The British are infamous for their two-seater front engined convertibles. Perfect layout for pure driving pleasure? 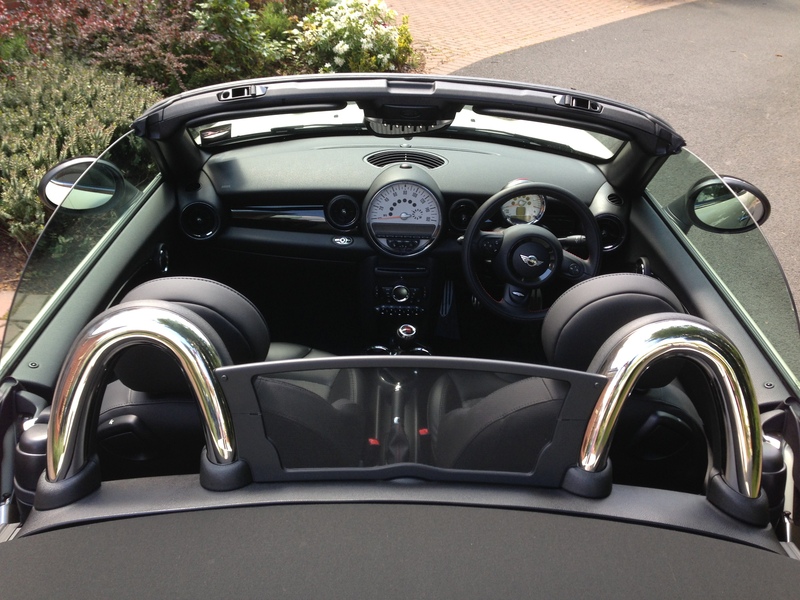 The open top adds to the excitement of the aural fixation from the engine, exhaust, road and elements. It’s all ironic given it rains 70% of time in the UK with our climate, yet the convertible is THE most popular type of car to have. Who can blame us when we came up with the formula and created perfection with the E Type Jaguar. Our beloved MINI has decided to enter this market after offering all those many smiles per hour in hatch form all these years. MINI created the Roadster by chopping the top off the hatch, raking the windscreen, adding a fabric top, chrome roll bars and a pop up spoiler to keep it planted at speed. But has this spoilt or added to the formula?? Don’t worry this added weight hasn’t blunted the performance or the feel of the MINI, don’t forget this is still a MINI just with open top for added fun. Everything is familiar inside the cabin with circular themed interior, funky toggle switches and a caricatured speedo. The exterior still has that loveable look of the Hatch with the round headlights, go faster viper stripes and dual exhaust exhausts at the rear. The Roadster was fitted with the following options: pepper white paint and black viper stripes, sports pack – JCW bodykit, 17′ cross spoke challenge alloys, sports steering wheel with red stitching which followed on to the gaiter and handbrake trim. Interior wise there was gloss black trim, black punch leather heated seats, air con/climate control, chrome interior trim, Bluetooth, MP3 CD player with DAB tuner and rear wind deflector. 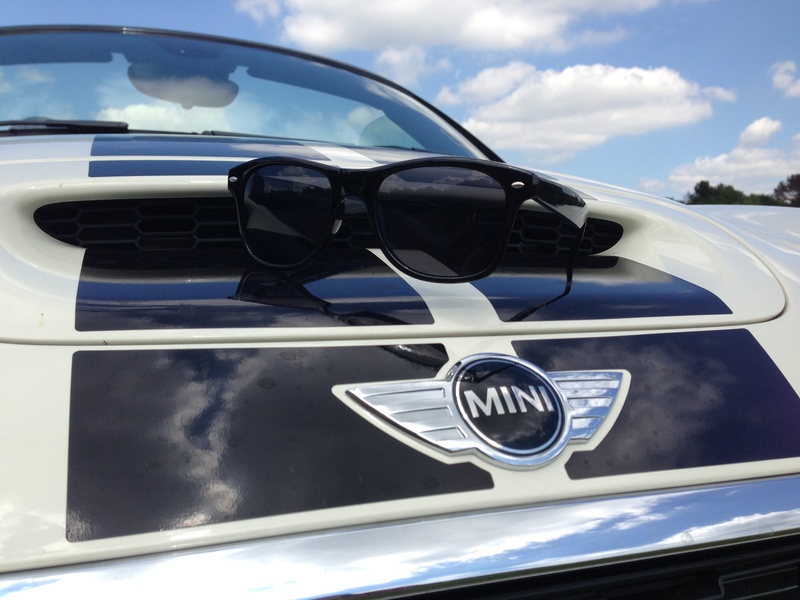 If you have been in a MINI before its business usual. The interior is all the same with the toggle switches, circular features and the caricatured central speedo which means you can’t get away with speeding. 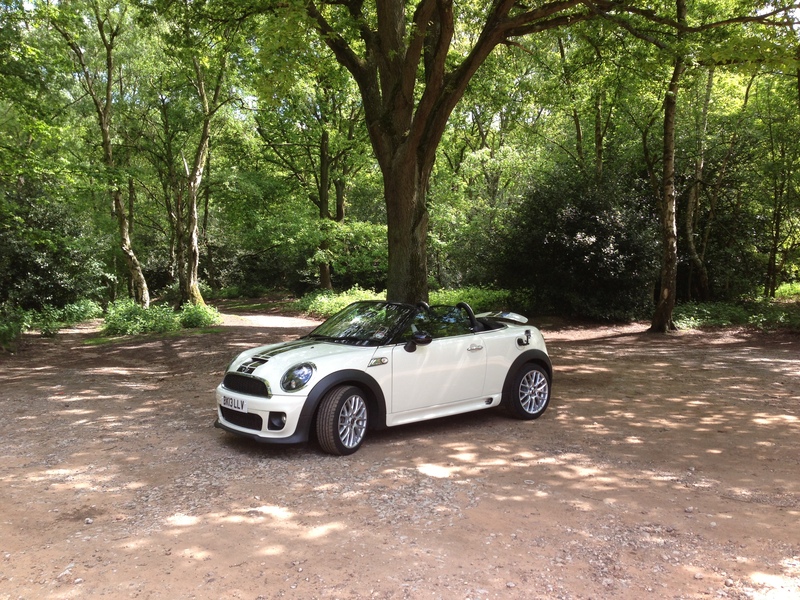 On the road the MINI feels the same as the hatch with that cheeky charm of that go karting handling and the grin that comes with driving a MINI whether it be at 5 mph in traffic or 60 mph on the B roads. The run-flat Continental sport contact 3 tyres didn’t ruin the ride or handling which surprised me as own a JCW which has firmer suspension. All the roads I took the Roadster on it rode very well so much so I wouldn’t advise getting rid of them. My minor grumble is about the chassis came when I hit a pothole as I felt the scuttle shake through the wheel but that’s the only time I felt it though. I took the Roadster on the back roads, town roads and the motorway to get a feel for the chassis and why people are obsessed with open top driving. I am not a fan of convertibles as I believe its type of car is suited to a hot girl and no guy looks good in one. Chopping off the roof ruins the chassis, dynamics and adds weight to car blunting the performance. Plus I cant see why you would give more money for all that, just to be able to lower the roof to have the wind in your hair. Yet it all made sense when I dropped the top on the MINI which is done by a handle then by holding down the toggle switch which shuts away the fabric top. The MINI Roadster is a looker with its raked windscreen and pop up spoiler adding to sportingness of it all. I had a cheeky grin on my face, when I admired the roadster for some shots. Lets move on to where it counts the driving and how it makes you feel. I test drove the Roadster spirited fashion on the roads I love and it just gripped when chucked into S bends and there was no torque steer or anything thing!!! It was like a ninja tip toeing on the asphalt and dash forward to slice its next bend. I was grinning ear to ear with sport button activated as the pops and bangs on the over run were fantastic and steering weighting is perfect for more road feel and every input from the loud pedal is sharpened. There are no excuses for you not to put your foot down to hear the exhaust rasp and feel how well sorted the chassis dynamics are. If don’t have a car that doesn’t pops n bangs then your missing out!!! I finally realised what everyone bangs on about with convertibles as I had my ray bans on, system turned up, sports button on, spoiler up, the top down and the beautiful clear blue sky above me. I don’t know if there was something in the summer air but I couldn’t stop grinning as I drove the roadster like a right poser. I understood that the open top adds to the fun of driving as the wind through your hair, exhaust being more audible, the wide open windscreen and the stares of jealously as I drove past onlookers like a movie star. Driving a convertible is all about how it makes you feel as you drive it and how other see you just like when you wear a savile row suit, you buy to look good and everyone else to tell you’re looking dapper. 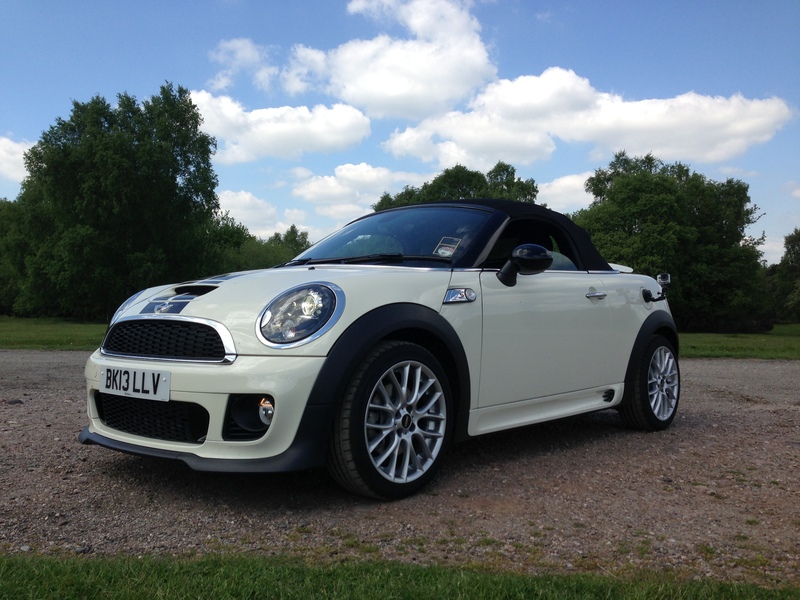 As the MINI is a front wheel drive car and the iconic roadster MX-5 being rear wheel drive. Is the front wheel drive layout taking away from the experience? Why would buy one over the best-selling roadster of the last two decades? Here is the reason to buy one – you will grin like a five-year old on Christmas day with all their presents. You might think the dynamics of the MX-5 would trump the MINI but hang on a second the 1.6 Litre MINI is nearly a full 1 second quicker the 2.0 Litre sport model in the Mazda and returns better mpg plus its cheaper to tax. Then we look at the boot space the MINI space dwarfs the MX-5 with 240 litres of space compared 150 litres. If we were kids in the playground the MINI beats the MX-5 in top trumps on every level but we are adults so the money comes into play. 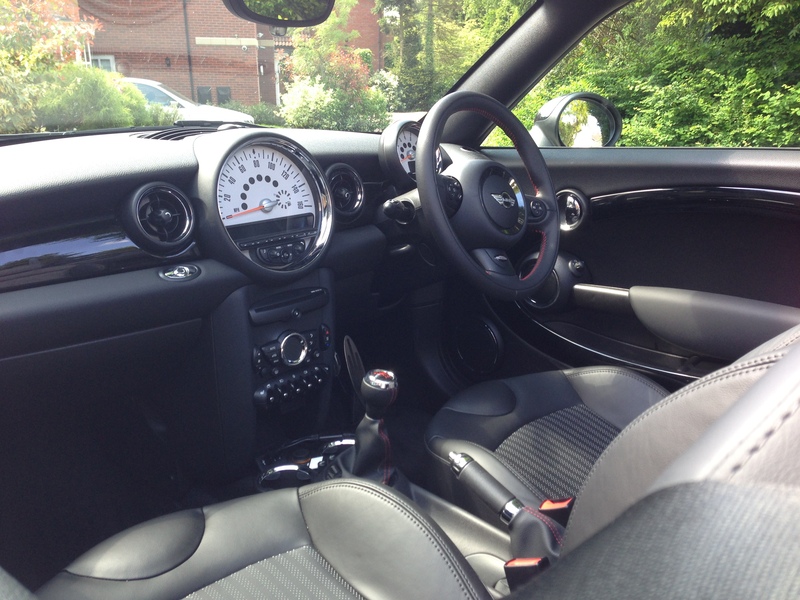 Yes the MX-5 is cheaper and it will feel it compared to the funky interior of the MINI but the MINI is cheaper where it counts on the running costs with it’s clever start stop function, low emission and fuel sipping engine. Secretly I didn’t want to like the Roadster as it’s a convertible but I feel in love with its extra charm it has over the hatch. 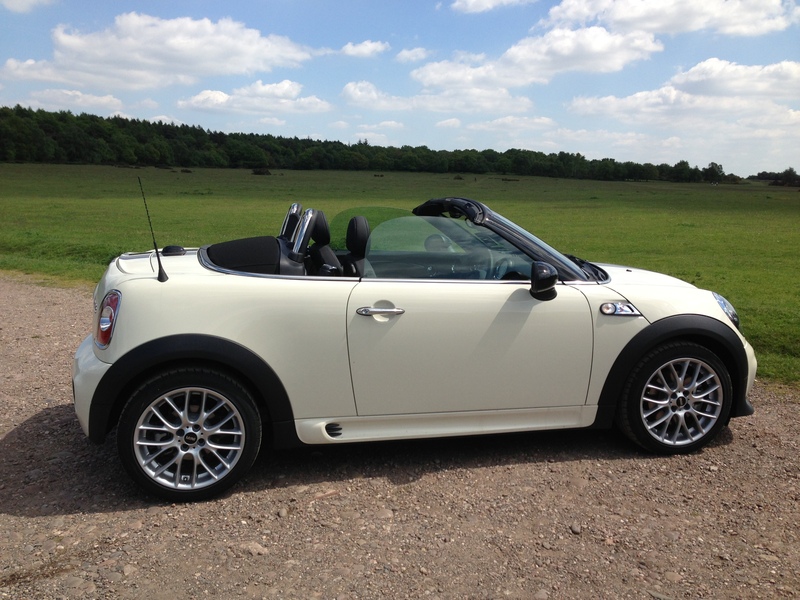 With prices starting at £20,940 for the Cooper S it’s not cheap for a 2 seater small car. Its beautiful silhouette and looks by passers-by will win you over.